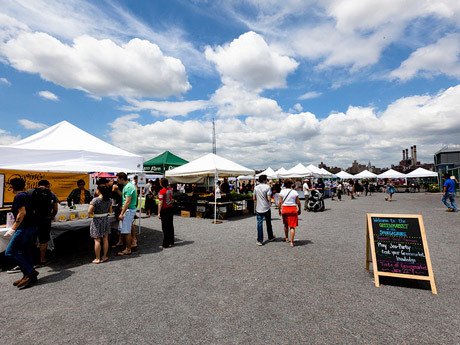 Stretches of Brooklyn once underserved by basic amenities are now teeming with innovative restaurants, artisanal food producers, gourmet trucks and, now, branded food fairs. It’s a winning combination that has attracted the attention of New Yorkers from all boro’s as well as visitors from around the world with an appetite for investment. From a commercial standpoint, boutique food manufacturing has been fueling a revival. In February 2011, Acumen Capital Partners bought the eight-acre site near the Marcy Houses from Pfizer for $26 Million and is leasing space to a variety of gourmet food producers (at $15/sq. ft) like McClures Pickles, Kombucha Brooklyn and Brooklyn Soda. The guys from 3rd Ward have secured a $1.5M grant from the city to open a kitchen incubator. Given their reputation from the excellent work they’ve done at 3rd Ward, I am certain that this will be a huge culinary success for Brooklyn. As for the impact of nouveau eateries, like that seen at Dekalb Market, a collection of food and fashion retailers housed in disused shipping containers tucked away in Downtown Brooklyn, and the over 100 food vendors on Williamsburg’s waterfront at the weekly Smorgasburg, or inventive outposts like Do or Dine, a gourmet fusion spot celebrated for its foie gras-filled doughnut, and the nearby bakery, Dough, where the motto is “We Fry in Bed Stuy,” it’s difficult to draw a direct dollars and cents correlation. But one only need to look more closely at the corridor South of Pratt Institute and North of Fulton on Bedford Avenue to understand that when wine bars and cafes replace liquor stores and store front churches, price per square foot moves northward. And though by now it’s become a not-to-be-missed destination for visitors to NYC, Roberta’s in Bushwick is simply one of the best pizza places in the world – we know we’re onto something when Sam Sifton and the New York Observor are writing about a little restaurant in Bushwick (Lucali’s in Carroll Gardens is a solid tie for best pizza btw). And the world is watching. Do or Dine owner Justin Warner can be seen on Team Alton on Food Network Star, and it doesn’t hurt that the media capital of the world lies just over the East River, making it a no-brainer when world-class event organizers like the founders of Bonnaroo chose Brooklyn’s Prospect park to host their mother of all foodie fairs, the Great Googa Mooga Festival, a day out for friends and family, and a magnet for the world’s greatest culinary talents to feed an increasingly growing population hungry for gourmet fair and an appetite for smart property investment. My own experience has shown that the food has a direct correlation with real estate values. Is it just a coincidence that the meteoric rise in Brooklyn values happened right when our food became famous? Prior to Smorgasburg, Williamsburg generally comped out at less than $40PSF for rentals. Now we’re hovering at an average of $60PSF on the North Side. Before Do or Dine, Umi Nom and a handful of other restaurants peppered the border of Bed Stuy and Clinton Hill, that area was getting less than $30PSF, now we’re around $40PSF and climbing. Whether it’s a cause or effect, I can’t tell you, but if you’re on the hunt for value, investing in one of the many neighborhoods where the food is simply outstanding will guarantee you a solid return on your investment.